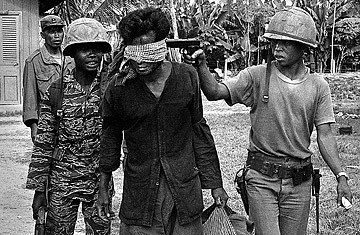 Pointing a pistol at the head of a blindfolded Khmer Rouge suspect, a Cambodian officer walks him toward a command post for interrogation November 4, 1973. At 82, Nuon Chea's eyesight is failing and most days he sports large, dark sunglasses. What remains of his white hair is slicked back in strands and though his breath labors painfully at times, he can still sit upright and at full attention for hours when discussing his role in Cambodia's brutal Khmer Rouge regime. A former chief lieutenant to leader Pol Pot, Nuon Chea is the highest-ranking Khmer Rouge member still alive  and the key figure in a coming courtroom showdown that international and Cambodian prosecutors hope will hold the remnants of the regime accountable for the estimated 2 million deaths that occurred during their bloody reign in the late 1970s. It's a trial that has long been coming. After Cambodia appealed for international assistance in setting up a genocide tribunal in 1997, it took another nine years of governmental foot-dragging and tortuous negotiations with the United Nations over the shape and structure of the court before prosecutors and judges were sworn in last July. Since then, the proceedings have encountered months of legal wrangling and administrative delays, leading to concerns that the few surviving Khmer Rouge leaders could die of old age before being brought to justice. This month, however, seems to mark a point of no return. On July 18, prosecutors submitted the names of five possible suspects to the court's investigating judges. That list has not been released to the public, though it's widely assumed to consist of elderly regime leaders like Nuon Chea, who have lived in quiet retirement since abandoning their movement in the late 1990s after reaching a peace deal with the government. For his part, Nuon Chea is sure his name is at the top of the list. With the death of Pol Pot in 1998, he admits that he is now "responsible for everything that happened." "I consider this court a battlefield fight between patriots and invaders. I will not allow anyone defeat me," the former communist revolutionary says, speaking from his small wooden house in Pailin on the Thai border in northwest Cambodia. If called before the court, he plans to explain that the killings were "not a policy" of the regime, a line all former Khmer Rouge leaders have stuck to. Nuon Chea rejects the idea that the fanatical legions of young Maoist rebels he led during the 1970s executed thousands and dumped them in mass graves, or that hundreds of thousands more were worked to death, succumbing to starvation and disease in the countryside after being forced to labor day and night to build the Khmer Rouge's vision of an ideologically pure agrarian society. Publicly he will only say that "mistakes" were made under the Khmer Rouge, and still speaks proudly of his former boss, Pol Pot. He has hinted that the skulls and bones in Cambodia's thousands of mass graves could merely be those of Cambodians killed by U.S. bombing during the civil war of the 1970s or the Vietnamese incursion of 1979. Nuon Chea is the most outspoken of the former Khmer Rouge leaders; other likely targets of the tribunal have taken a lower-key approach. Khieu Samphan, 76, the former Khmer Rouge head of state, lives near Nuon Chea in Pailin but has had little to say on the speculation that he is one of the five defendants. Ieng Sary, 78, the regime's former foreign minister, and his wife Ieng Thirith, 75, the former minister of social affairs, have also avoided the media. A young man who answered the door at their large house in a quiet neighborhood in central Phnom Penh said the couple had recently gone to Bangkok, where they frequently travel for medical treatment. Kang Kek Iev, 63, known as Duch when he headed the S-21 torture center in Phnom Penh where thousands were imprisoned and executed, is the sole regime member in prison. Now a born-again Christian, Duch has been held in pre-trial detention since 1999 after being discovered working for a local humanitarian organization. With the names of the five suspects now in the hands of the investigating judges, the evidence will be analyzed  prosecutors have submitted 14,000 pages of documentation, including interviews with 350 witnesses  and a decision taken on whom to charge. That could happen as early as January 2008, with the first trials soon after, officials at the tribunal said. All that's needed now is just a little more patience, according to Youk Chhang, Cambodia's foremost researcher on the Khmer Rouge and head of the Documentation Center of Cambodia. "This is a lesson we can learn from. Not just for Cambodia, but globally, as genocide seems to happen everywhere now," he says. "It's time for us to solve this and move on."